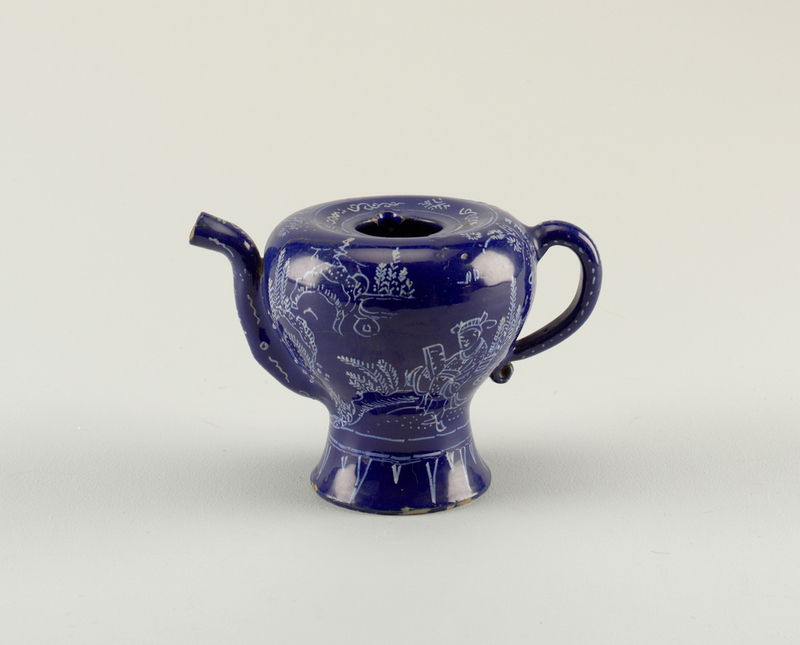 The decoration of this coffee pot, with its solid ground of cobalt blue, is of a type known as “bleu persan”, after a style of Persian ceramics imported to Europe in the late seventeenth century. Cobalt is one of the few compounds capable of withstanding high kiln temperatures, and consequently is the ideal medium for decorating pottery. In the seventeenth century, one of the best sources for high quality cobalt was present-day Kashan, Iran. For English potters, the extravagant use of imported cobalt was costly when compared to the production of ordinary white tin-glazed pottery— tin being readily available from large deposits in Devon and Cornwall. The pot’s chinoiserie decoration has a loose, slightly naïve style typical of seventeenth century English pottery. Rather than being fine artists, most decorators were practiced copyist whose simplified designs could be applied rapidly and in multiples. The tube-like spout is a type commonly found on English posset pots, a vessel from which one would drink a thick beverage made of curdled milk and spiced ale. Here, the established spout form has been repurposed for the consumption of the fashionable new drink of coffee.